A Mass of Christian Burial for Sister Ellen Hensberry, D.C., was celebrated Feb. 19, 2016, at the Daughters of Charity DePaul House Chapel in Albany, N.Y. Burial followed at St. Agnes Cemetery in Menands, N.Y. Sister Ellen died Feb. 15, 2016, at St. Louise House in Albany. 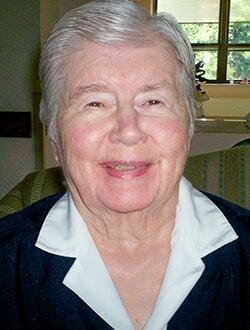 She was 88 years of age and 69 years vocation as a Daughter of Charity of St. Vincent de Paul. Born in Syracuse, N.Y., April 4, 1927, Sister Ellen (baptized Ellen Theresa) was one of five children born to Francis and Mary (Rohner) Hensberry. Sister graduated from St. Patrick’s High School in Syracuse in 1946. She entered the Daughters of Charity in October 1946. Sister Ellen earned her Bachelor of Arts degree in Secretarial Science in 1963 from St. Joseph College in Emmitsburg, Md. Sister earned her Master of Science degree in Education from St. John’s University in New York, N.Y., in 1969. Following initial formation, Sister Ellen served at Holy Cross Academy in Lynchburg, Va. (1948 to 1953); St. John’s School in Baltimore, Md. (1953 to 1954); St. Charles School in Pikesville, Md. (1954 to 1960); Seton High School in Baltimore (1960 to 1962); Elizabeth Seton High School in Bladensburg, Md. (1962 to 1967); Utica Catholic Academy in Utica, N.Y. (1967 to 1968); Seton High School in Endicott, N.Y. (1969 to 1976); Seton Central High School in Binghamton, N.Y. (1976 to 1978); Ballantyne Brae (where Sister also served as the Local Community Superior) in Utica (1978 to 1982); Our Lady of Lourdes in Utica (1982 to 1985); Cathedral School (where Sister also served as the Local Community Superior) in Syracuse (1985 to 1991); St. Mary’s Hospital in Rochester, N.Y. (1991 to 1992); St. Agatha’s Center (where Sister Ellen also served as the Local Community Superior for part of her mission time there) in Canastota, N.Y. (1992 to 1998); St. Louise House in Albany (where Sister served as the Local Community Superior), (1998 to 2001); DePaul Provincial House in Albany (July to October 2001); Marguerite Naseau House in Ogdensburg, N.Y. (October 2001 to 2002); Sisters of Charity Hospital in Buffalo, N.Y. (2002 to 2003); and St. Louise House in Albany, where Sister Ellen entered the Ministry of Prayer in 2003. She served in that ministry until the time of her death. Sister Ellen was preceded in death by her parents and two siblings, Mary and Peg. Sister Ellen is survived by her sister, Kathryn; and her brother, Philip and his wife Jeanne; several nieces and nephews; her Sisters in Community; and many friends.